Note: Lucis Trust was first named "Lucifer Publishing". This tells us quite a bit not only of what they believe, but what the United Nations is built upon....trusting Lucifer. -W.E. 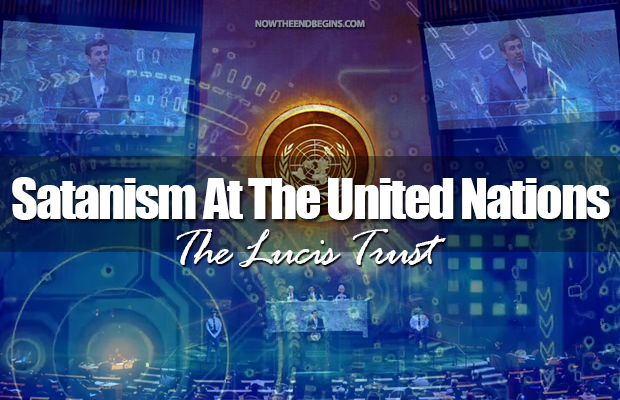 Ben Knight Editor’s Note: This is a fascinating expose of “Lucis Trust” and how the United Nations has adopted its satanic principles. The Lucis Trust was founded in the 1920s by the progressive Alice Bailey who was inspired by the Theosophist and occult mystic, Madame Blavatsky. What they won’t say on the website is the fact that Alice Bailey laid the groundwork for the plans of the New World Order. She also made plans for the destruction of Christianity. N.B. Today they introduce Transcendental Meditation ™ in schools which takes children to altered states of consciousness to meet with demons (spirit guides) = New Age. Today you wonder why our governments are legislating laws contrary to the Bible and why the church is compromising the Word of God. It is a process of implementing The Plan – A 50 year strategy of the New Age Movement to fulfill its ultimate goal to establish a One World Government, a One World Economic system and a One World Religion. Today the strategy almost in its entirety has been adopted by the United Nations and today a lot of it is already law in many nations. This deception has crept up unobserved on so many people. It can best be demonstrated through the well-known analogy of the frog in the pot of water. If you put a frog in a pot of boiling water, it is smart enough to know that it is in terrible danger and will immediately jump out to safety. But if you turn up the heat very slowly, a little at a time, it doesn’t notice the changes that are taking place and will slowly cook to death. Many people today are slowly cooking to death and don’t seem to realize how far they have come from where they once were.